As I am sure you know from your students, classes were canceled for today. I have had some questions about why did we cancel, because it looks (from weather reports people have seen) that it is sunny and above freezing, so why cancel classes? 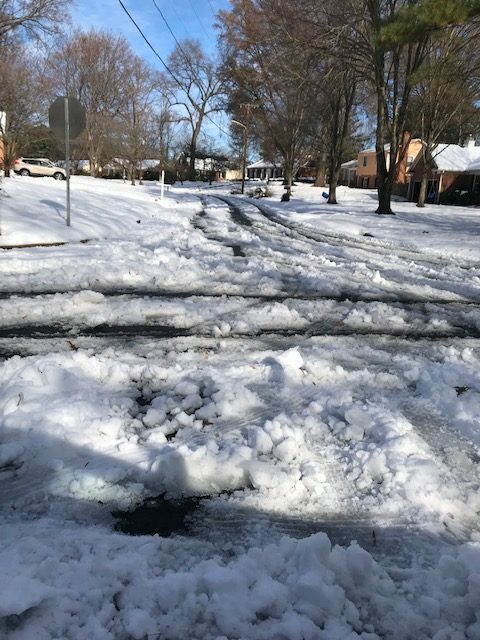 This is my best unofficial interpretation: we had an unprecedented amount of snow in a part of the country that does not have the snow removal infrastructure of a major Northern city (such as the one I grew up in). And while campus proper has an outstanding snow plan (roads and sidewalks are plowed and salted very, very quickly), the rest of the city does not fare as well. 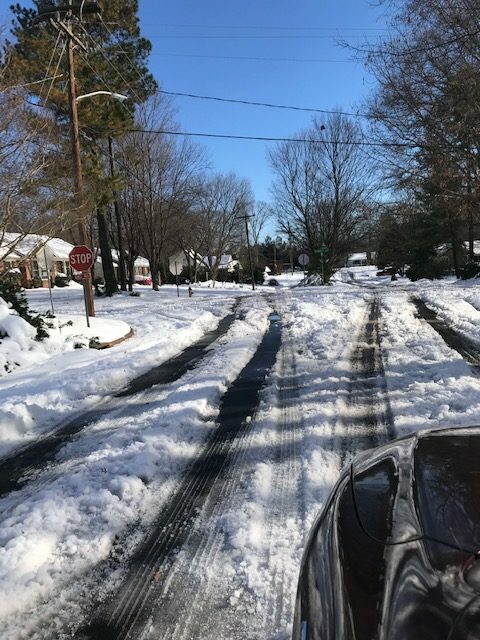 Normally what happens in Winston-Salem is that major roads are cleared first, then secondary roads. Sometimes neighborhoods are plowed, but often they are not. The joke around town is that if you can make it from your driveway to the main road, you are probably OK, but making it to the main road is iffy at best. For example, in my neighborhood, we have not been plowed at all. And likely will not be. 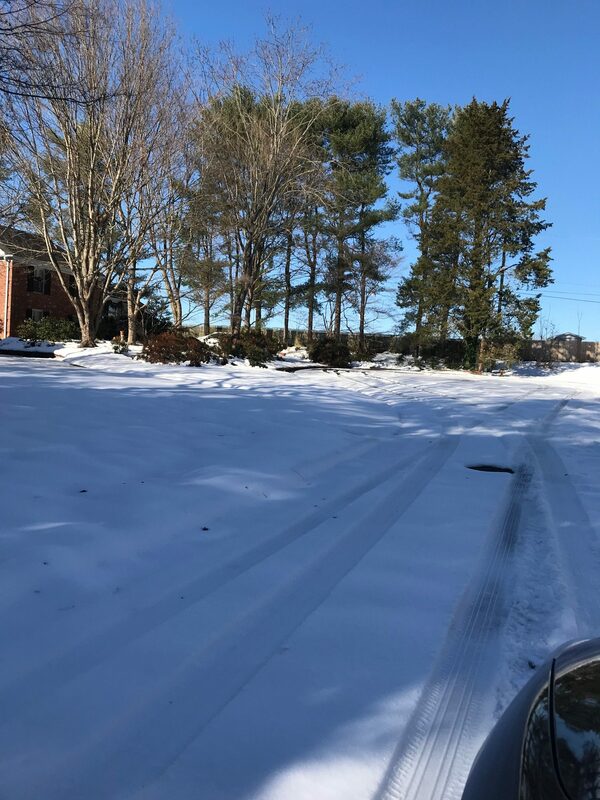 When I walked out of my house this morning, I found that the snow had a heavy crust of ice on the top, making it nearly impossible to shovel (some pics below for context). I went out to run an errand this afternoon and it was dicey getting off my street and to the main road. Once I got there, the main road was well plowed. So in making the decision yesterday to close today, consideration was given to students who live off campus (as well as faculty and staff), knowing it could have been potentially very treacherous to drive. Another factor in deciding operating status is whether Wake shuttles can drive their routes safely. I know that students are antsy to take their finals, and families are anxious about that too. I would ask your patience and understanding that safety comes first. I also got some questions about why certain finals are being given now vs. postponed until January. Individual faculty members have the discretion to administer their finals in the way they think is best. For some, that might mean electronic administration; for others, it might mean giving the test at a different time, or during the first week of classes in January. I can promise you that there has been a lot of discussion about how to work with finals given the closures, and the faculty members have come up with the solutions that they believe are best for their courses. Again, we appreciate your understanding of the many complex considerations at play.